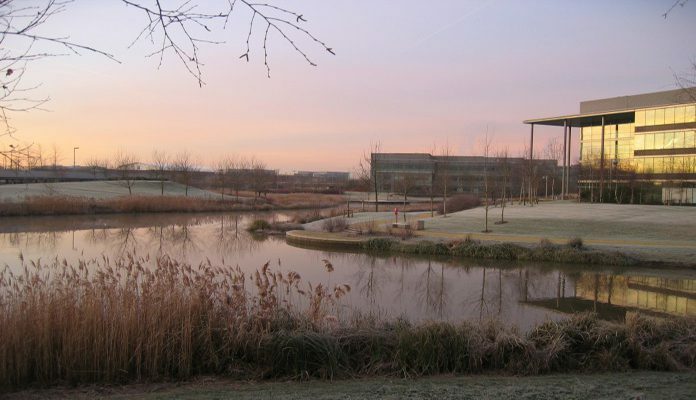 The development of GreenPark, Reading was driven by the vision of Prudential Property Investment Managers (PRUPIM) to develop a business park for large and small growing businesses that combined natural beauty and outstanding architecture. The master-planning team created a vision to deliver the first phase and set the parameters for future phases. In the 12 years since development commenced, 19 of the 26 buildings are complete, 2 are in construction and 4 more have received planning permission. 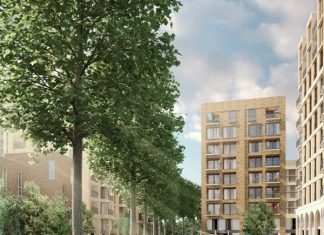 Additional phases have since been added which include the consented Green Park Village with 750 residences and a new railway station. A major challenge for the landscape designer was to create a sense of unity and identity for the whole site while responding to the different architectural styles of the buildings and giving each plot its own individual identity. The clients recognised, at the outset, that the landscaping was integral to creating this sense of identity, to making the development attractive and marketable and importantly, contributing to improving local ecological diversity and sustainability. To ensure this, they specified that, in addition to the creation of the Longwater, a large artificial waterbody forming the central feature of the GreenPark complex, a minimum 30% of each plot should be soft landscaping. As the site is located on a floodplain, the flood control regime also demands that the landscape should be robust and resilient to inundation while helping to control waterflow and creating a habitat for various species. In addition to the high rates of occupancy, the ecological value of the site is also now apparent. A network of footpaths runs through the GreenPark complex, giving public access to the range of habitats on site. These routes were developed in conjunction with The Ramblers Association and the Local Authority footpath officers and now form part of the local footpath network. As such, the GreenPark complex is a developing wildlife habitat and a strong basis on which to develop future biodiversity enhancement. In 2005, a Biodiversity Action Plan (BAP) was developed by AMEC (updated in 2008) which, in conjunction with an Ecology Working Procedures Manual for the GreenPark site, provides practical guidance and aims to promote the continued fusion between the aesthetic landscape characteristics of the site and its increasing biodiversity value during day-to-day ground management. GreenPark is an example of the value and importance of landscape to creating synergy and coherence between the potentially conflicting interests of commerce and the environment and how, with the clear vision and commitment of the client, underpinned by good architectural and landscape design, you can create a win-win situation. Creation of an inspiring landscape setting for high-quality office development to include a central water-body that contributes to flood attenuation, is visually stimulating and ecologically valuable. The landscape anticipates seasonal flooding and plant species were selected to suit wetland conditions and to provide valuable new wildlife habitat. Planting included resilient trees, aquatic, marginal, submerged, floating and emergent species. This is a rare opportunity to revitalise a part of London and to knit it seamlessly back into the surrounding city.